This Delorean is in hover mode, so it should hover, right? Unfortunately the mainline hover mode doesn’t come with a stand, but fortunately the Star Wars Snow Speeder does! This does mean that said Snow Speeder will be grounded for a little while, but Clay Matthews approves, so I think we are okay. Of course after this shot the precariously superglued stand snapped off again, so I was left to my own creativity to make it hover. Lightly laid on top of dried grass? Not too bad. On top of some squirrel refuse? Pretty good! Just imagine those nut shells aren’t there, okay? On top of a pebble, hovering just above the dirt? I like it. 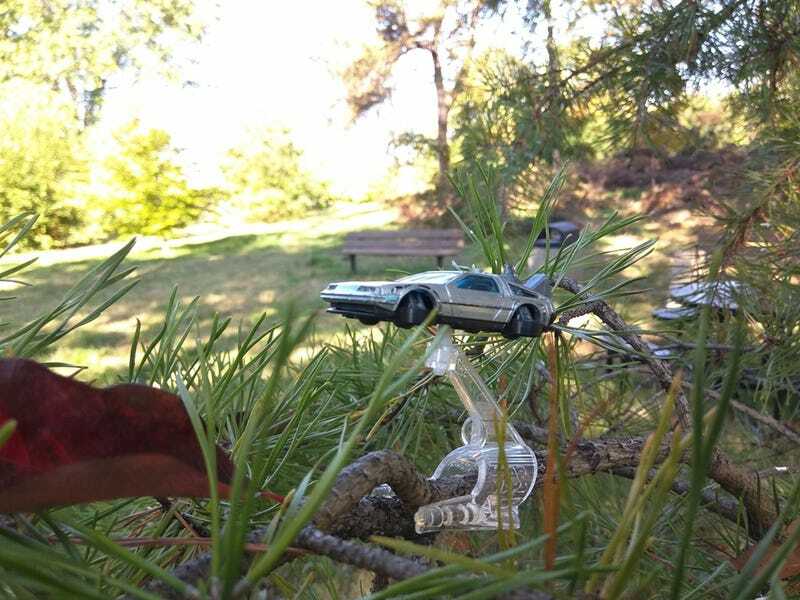 Hope you guys did too, and happy BTTF Day! Post all the Deloreans! !